12345 S. El Monte Road, Los Alto Hills. Tickets are available online at www.theatreworks.org or by calling 650-463-1960. In April 1941 – eight months before Pearl Harbor – history tells us that pockets of America were divided in their loyalties and biases concerning the events going on in Europe and that many in America wanted to put their heads in the sand and hope that the U.S. would not once again in the twentieth century be drawn into a European war. 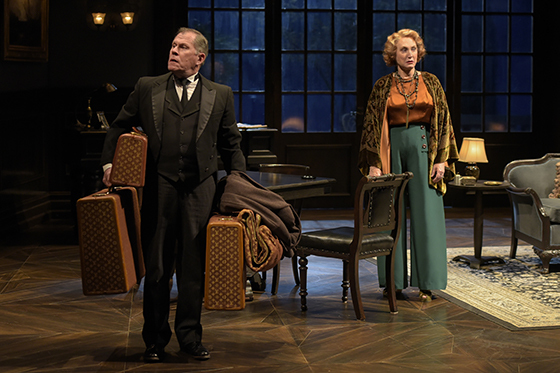 On Broadway that month, Lillian Hellman’s latest play, Watch on the Rhine, opened – a play whose title and whose increasingly tense and disturbing unfolding of events become a warning to America to wake up and to ready itself for darker days ahead. In a time when once again America is clearly divided regarding what some see as dark, threatening clouds and others see as long-awaited/needed shifts in government policies, Berkeley Repertory Theatre (in a co-production with the revered Guthrie Theatre of Chicago) stages a family drama that is seductive with its early humor; fast-moving with three acts that seem to fly by; and ever-more steeped in mystery, intrigue, and unease. Fanny Farrelly is the grande dame of her large estate home twenty miles from Washington, D.C., a woman who insists breakfast is “ at 9 a.m. in this house and will be until the day after I die” and one who also believes gossip is one of the great joys in life (“a snooper shows interest in life”). On this particular morning, the household she shares with her bachelor son, David, and with the memory of his deceased father (whose picture and legacy still dominate the home) is all in nervous atwitter in anticipation of the prodigal return of Sara. The daughter/sister who married outside the wishes of her mother has not been seen in twenty years and is arriving with her German husband and three, never-met grandchildren. Caitlin O’Connell’s Fanny cannot sit still, can hardly stop talking, and barks nervous commands and comments to Joshua and her long-time servants (and clearly near-family members), Anise and Joseph. 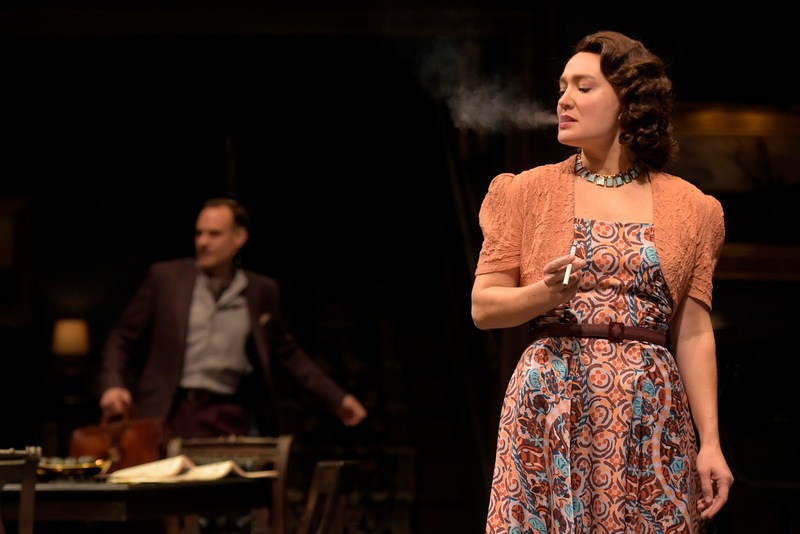 Ms. O’Connell sets the tone and scene for what appears at first to be a family period comedy, with any drama to come being centered on things like Joshua’s apparent attraction with houseguest Marthe, whose Romanian husband Teck is clearly suspicious and not amused. But once the Muller family arrives with the look in clothing, luggage, and countenances of refuges just escaped from somewhere terrible, the shift of Lillian Hellman’s play commences, so wonderfully directed by Lisa Peterson with the skins of the onion coming off layer by layer to reveal backgrounds and political leanings of Fanny’s guests – both those related and those not. The global, dangerous, and ultimately deadly struggles of Fascism and anti-Fascism soon land right into Fanny’s sedate and beautiful living room – all the while continue a family reunion with grandkids immensely cute and astute, a background love triangle/battle, and an ongoing upstairs/downstairs war of wits between Fanny and her servant/friend, Anise. The scenic design of Neil Patel establishes the perfect imagery for Hellman’s play. The ornate, sophisticated, and massive living room is beautiful in every respect and speaks of a household established in its gentry and history. Windows and a patio door open onto a setting of trees and a sky that drips in colors deep and rich, thanks to a stunning lighting design by Alexander V. Nichols. But those sky colors also have shades of troubling purples, and the room has dark corners and recessed ceiling shadows that warn that all is not as idyllic as it may first seem. The music composed by Paul James Prendergast along with his sound design also intones melodies that at first invite and then others that catch one unawares in their echoes and incomplete chords. This is a world where life is attempting to be normal and upbeat with a bit of matronly quirkiness built in, but it is also a world where life is taking a turn due to outside forces that no longer can be held at bay. 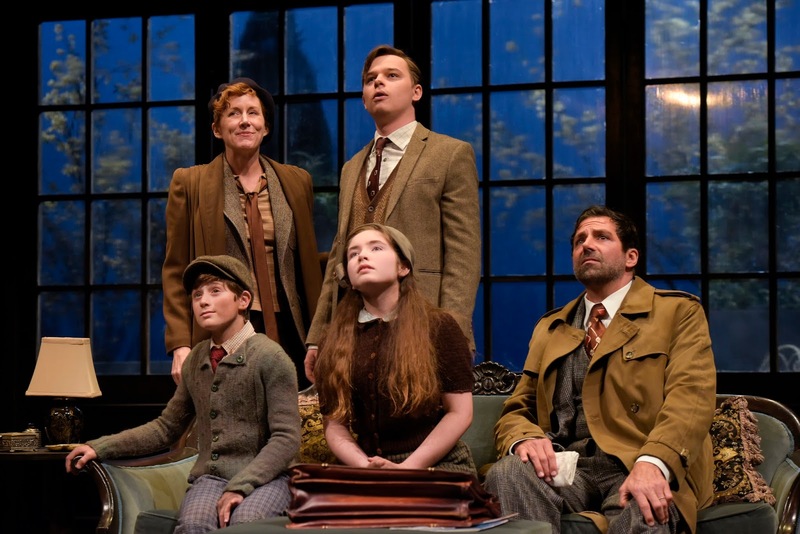 Joining Ms. O’Connell in this well-cast, compelling ensemble is a mixture of accents and dialects that begin to illustrate the global nature of the conflicts coming. Leontyne Mbele-Mbong is the very French in speech and manner life-long servant of Fanny, Anise, whose dress and demeanor provide no clue that she is anything but an equal (if not the superior) of Ms. Farrelly. As played by Kate Guentzel, the houseguest Marthe is a woman of European heritage whose character increases in boldness and sureness of self as she begins to break away from the threatening hold of her husband, Teck De Brancovis, a Romanian whose dark and sinister nature is evident the first time Jonathan Walker appears on stage. The distaste that somehow one gets long before his Fascist leanings become clear comes from the way Mr. Walker masterfully uses his posture, voice, and eyes to send chills down one’s neck even when he is making seemingly small talk. 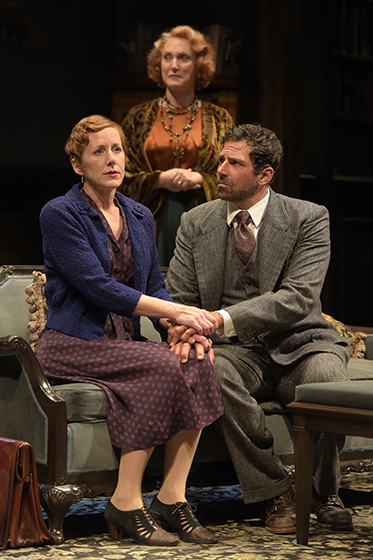 David Farrelly lives in the shadow of his father (“Mama only thinks of me as a monument to Papa”), but Hugh Kennedy transforms this forty-something man who seems to have little to do in life but flirt with the visiting Marthe into a much more interesting and noble character as the acts progress in Hellman’s play. 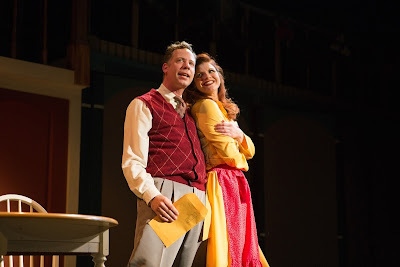 Sarah Agnew is bubbling with enthusiasm and optimism as she bursts into the household that her character -- David’s sister, Sara Muller -- long ago absented. Like Hellman’s play, shifts in her own demeanor begin to occur as signs of a darker background of difficult life events for her and her family begin to reveal themselves and as a courageous, self-sacrificing side of her comes forward and into light. Sara’s husband, Kurt -- with hands that shake uncontrollably at times and a body large and strong yet apparently beaten and bruised deep within by events from his past fighting the forces of Fascism – is powerfully and movingly portrayed by Elijah Alexander. Together, the couple is a history lesson of what thousands of families were going through at that time in European history, both in their attempt to escape horrors as well as in their resolve to resist and risk life and limb to save others resisting. Rounding out the cast is a trio of Muller children who provide many chances to smile, even as the play’s clouds darken, and whose own attempts in courage are heart-warming and heartbreaking. Emma Curtin is the loving and lovable daughter just entering her teens, Babette, who has learned many skills in her short life of being on the run with her border-crossing, danger-dodging parents. 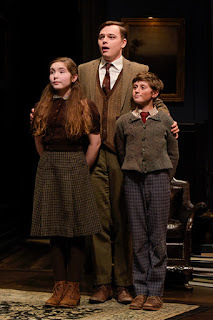 Joshua Muller is in his mid-teens; as played by Silas Sellnow, his quiet, reserved manner does not hide the astute observations he is evidently making of the unfolding situation around him; and his ability to be both boy and man is impressive to witness. Winning everyone’s hearts and big smiles (even his grandmother’s after much mocked reluctance to like him) is Bodo (Jonah Horowitz), who may be only eight or so but whose exacting speech, many languages spoken (or at least attempted), and big words employed make him often more like an adult in a kid’s body – that is until events leave him the sad and scared little boy that he really is. Kudos goes to each of these three, young actors for outstanding performances. Watch on the Rhine continues through January 14, 2018 in the Roda Theatre, Berkeley Repertory Theatre, 2015 Addison Street, Berkeley, CA. 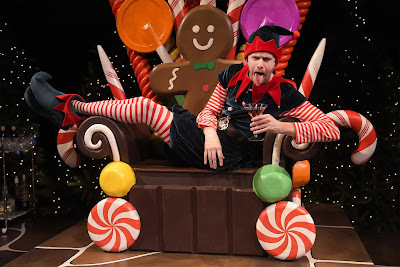 Tickets are available at http://www.berkeleyrep.org/ or by calling 510-647-2975 Tuesday – Sunday, noon – 7 p.m.
For those who celebrate it, Christmas universally evokes feelings of nostalgia based on memories that often seem even more precious and wonderful than the actual events may have actually been, especially when it comes to those of one’s childhood. The smell of turkey roasting erases how dry mom’s bird was after she cooked it twice as long as needed. The excited anticipation we now recall of the days leading up to the big morning forgets the inevitable tensions of preparations and kids getting in the way. Happy arrivals of relatives we see in our mind’s eyes close their lids to the tensions as soon as everyone has spent a few hours together and topics that were not to be touched plop themselves on the holiday table. But those happy memories are what make many of us anticipate once again the annual arrival of yet another Christmas season. A Christmas Story: The Musical – the 2012 Broadway offering based on a 1983 popular movie – is one man’s memories of a particular Christmas of his childhood. As translated to stage by Joseph Robinette (book), the 1940 setting and events are ones that Norman Rockwell could have had a heyday; for there is an innocence of intentions, a perfection only slightly marred by individuals’ quirkiness, and bad things which are the kinds that work themselves out with no harm done and all smiles in the end. 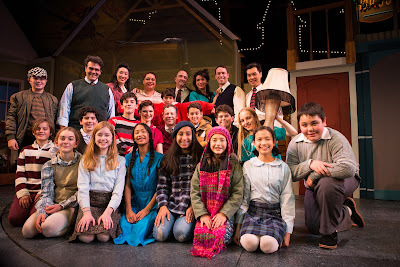 Produced this holiday season as a gift to its audiences – especially those with kids – San Francisco Playhouse presents A Christmas Story: The Musical that is full of rambunctious, cute kids with the kinds of flare-ups and flaws we expect to see in a TV Christmas special. There are also adults who have been rose-glass-colored by Jean Shepherd’s memory bank where his Mom was the nicest person on earth, Dad was totally strange but lovable, his Brother was weird but a pal (even though they always fought), he was fatter and dorkier than most other kids, and Miss Shields (his teacher at nine) was someone he secretly loved and believed saw him as the chosen one in the class. 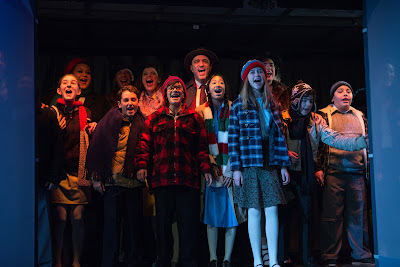 The result is a syrupy sweet production full of gosh-darn bits of yesteryear and musical production numbers that will delight the young-at-heart -- and especially the young-of-age. 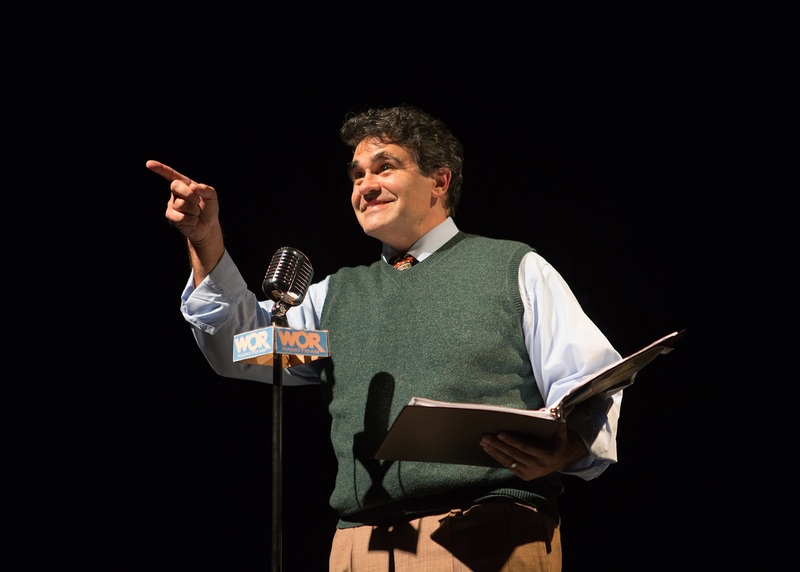 Jean, now a radio story-teller played by Christopher Reber, is telling his story and watching from the sidelines as his memories come to life on the multi-leveled stage that we see. Jacqueline Scott has created a set with parts of his boyhood house unfolding like a page in a children’s pop-up storybook. Other parts of his life’s panorama emerge on a spinning table or from behind a screened wall where recalled school and town scenes and the people populating them magically appear (along with even the family’s late-30s convertible with its faulty tires). The story he tells of course centers a lot on himself, once known when a nine-year-old as Ralphie. The particular Christmas season he relates is one when Ralphie has his heart set on only one thing: How to convince someone (mom, dad, Miss Shields, Santa) that he must receive an official Red Ryder Carbine-Action 200-Shot Model Air Rifle (that also tells the time). The fact that everyone of them warns him, “You’ll shoot your eye out” in no way deters the determined Ralphie, who imagines a whole series of scenes where he will be an acclaimed hero against robbers, bullies, and kidnappers once he has his prized gun. “Ralphie to the Rescue” is just one of several big numbers that Benj Pasek & Justin Paul (music & lyrics) employ to let a kid’s imagination explode on a stage full of cowboys and bad guys, evil department store elves, or his favorite teacher as a glamorous singer in white mink. Their music is upbeat like one would find in the old Saturday morning shows on TV with lyrics that tell the story from a kid’s point of view – all of which are mildly enjoyable if one is over 12 and a kick and hoot for all those younger. At the Sunday matinee I attended, Mario Gianni Herrera stepped into the role of Ralphie as the understudy for a sick Joshua Briscow; and he did so without stumbling on even one spoken or sung word! His Ralphie is one full of brightened wonder and optimism in his eyes as he dreams and sings of his hoped-for Red Ryder gun. When things sometimes turn into temporary disasters (as happens in any nine-year-old’s life), his looks of momentary sadness are enough to melt hearts as big, ol’ tears well in those same, cute eyes. Kudos go to Mario for stepping in with his own flair and fashion into the lead role for one afternoon. Mario’s family includes his brother Randy (played by a shy and adorable Jake Miller, who alternates the role with Kavan Bhatia), a little boy who spends much of his time under the kitchen sink and who can only be persuaded to eat him dinner when a patient, understanding mom allows him to become a piggy at the slop trough. Mother, as played by Abby Haug, could substitute any day for June Cleaver (“Leave It to Beaver”) or Margaret Anderson (“Father Knows Best”). In Jean’s memory, she is practically flawless. His memory of Mother making everything right for him after his encounter with a bully on the playground offers Ms. Haug the opportunity to shine in a beautifully sung “Just Like That,” the one truly adult-appealing number of the Pasek/Paul musical. Father (identified by Jean as “The Old Man”) is a knockout role for Ryan Drummond. As the “most feared furnace fighter in all of Indiana,” Jean’s memories of his dad are of a guy always having to fix something amidst a cloud of #!@#! words his mom covers the kids’ ears so they hopefully will not hear. The Old Man is also obsessed in entering crossword puzzle contests, and Ryan Drummond milks both the completing of a to-be-submitted puzzle and a resulting won prize for every laugh possible. His face molds into expression hilarious as they are remembered seen from a nine-year-old’s eyes, and he gets a chance to perform a dance number on the kitchen table and chairs, one worthy of any chorus boy on Broadway. If there were a “Best Featured” acting role awarded for this SF Playhouse musical, it would hands-down go to Katrina Lauren McGraw as Miss Shields. Each time she in on stage in that role, the spotlight of attention automatically goes her way (even when surrounded by nine jumping, just-too-cute kids). Never is that more true when Ralphie conjures her up as the star of a 1930’s speakeasy when Ms. McGraw gets a chance to belt out in a huge vocal number “You’ll Shoot Your Eye Out,” complete with a chance to shine as a tap-dancer. Director Susi Damilano guides this large cast of both the young and the old through many scenes of shifting sets, never allowing even a few seconds of non-action pause when a young child in the audience might lose attention. 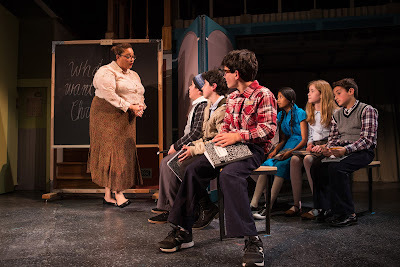 Abra Berman has designed costumes 100% All-American for the middle-class family and town of 1940’s Indiana while at the same time creating those only a kid’s wild imagination flamed by Saturday matinees at the movies could engender. Thomas J. Munn’s lighting and Theodore J.H. Hulsker’s sound designs provide their own scene-setting touches to evoke both nostalgic and kid-exaggerated scenes. Dave Dobrusky performs his normal magic as Music Director in leading the 5-piece orchestra as they perform the musical’s score with much pizzazz and some tongue-in-cheek. 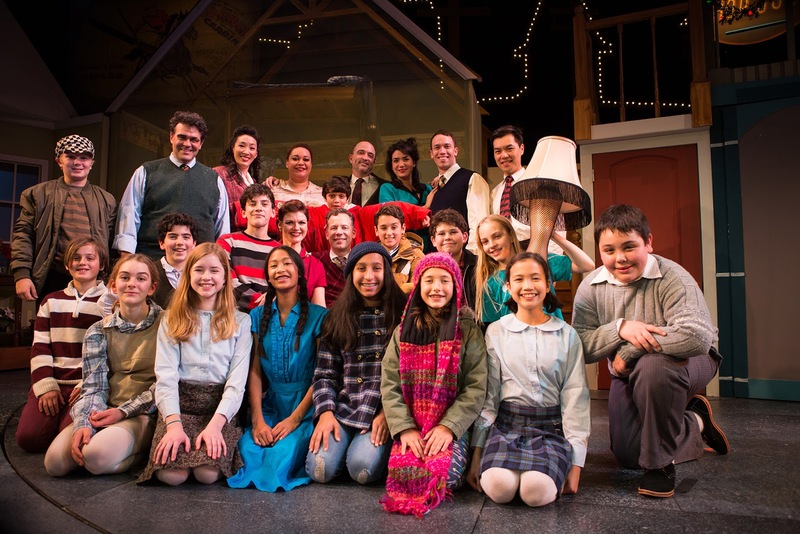 While maybe not the cat’s meow for all adult theatre-goers sans children, San Francisco Playhouse’s A Christmas Story: The Musical is certainly the perfect family outing for anyone who is looking for how to introduce or further enhance a youngster’s love for live theatre. I cannot imagine any child leaving the theatre not wanting to go to another play or musical as soon as possible. I also believe that any family attending together will be walk out hand-in-hand with big smiles, all anticipating the best holiday yet for December 2017! A Christmas Story: The Musical continues through January 13, 2018 at San Francisco Playhouse, 450 Post Street. Tickets are available at http://sfplayhouse.org/ or by calling the box office at 415-677-9596. 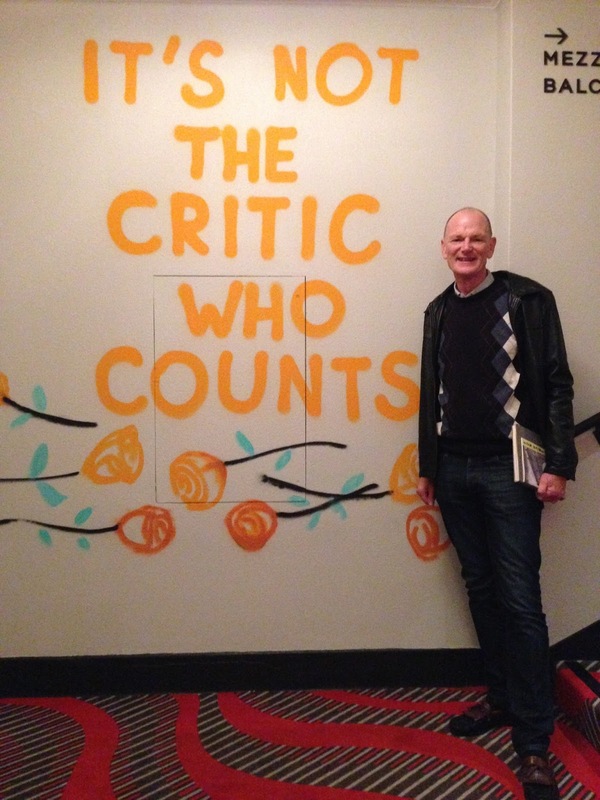 There are times when going to the theatre should be just for the fun of it, with nothing to be learned and with no heavy messages. After the year that we in the audience have endured in 2017 with all the troubling turbulence in our political and physical worlds, TheatreWorks Silicon Valley’s exceptionally conceived and executed Around the World in 80 Days is just the kind of diversion to help us remember that there is and can be hope for Happy Holidays and a Happy New Year. 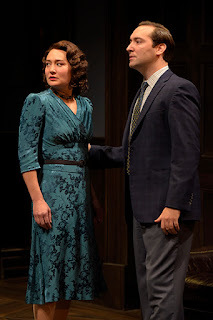 Please continue to Talkin' Broadway for my full review: https://www.talkinbroadway.com/page/regional/sanjose/sj105.html. 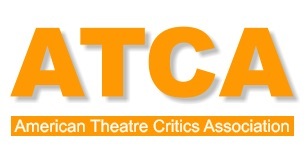 TheatreWorks Silicon Valley at Lucie Stern Theatre, 1305 Middlefield Road, Palo Alto. Tickets are available at http://www.theatreworks.org/box-office/buy-tickets/ or by walk-up one hour before performances. Entitled The Millionth Production of A Christmas Carol, the play by James Kopp receiving its world premiere at Pear Theatre is a love story to local, struggling theatre companies. By the thousands across America in towns large and small, these troupes struggle to stay alive on budgets bare, often returning to Dickens or Shakespeare (as in Midsummer Night’s Dream) to bring in the occasional theatre-goer so they can also offer to the few and faithful Chekov, Moliere, or some other more challenging fare. 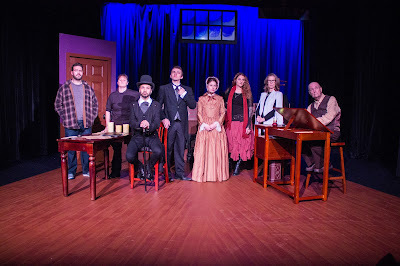 The play explores what goes on behind the scenes on one such company ... especially when it is visited by a ghost not in the script. 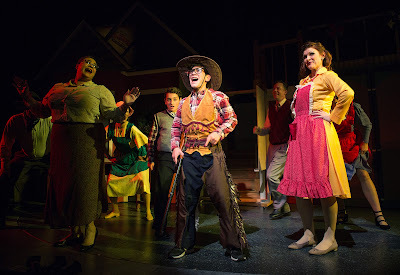 For my full review, please click to Talkin' Broadway: https://www.talkinbroadway.com/page/regional/sanjose/sj104.html. 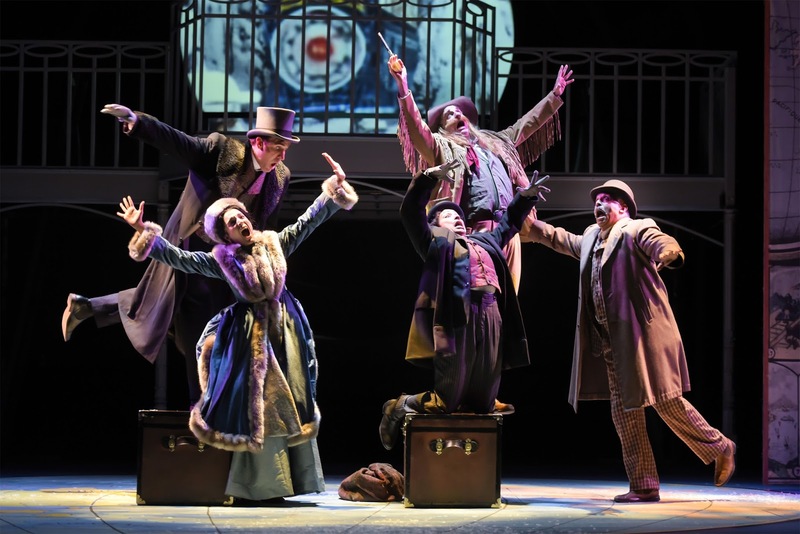 The Millionth Production of A Christmas Carol continues through December 17, 2017 at Pear Theatre, 1110 LaAvenida, Mountain View. Tickets are available at www.thepear.org or by calling 650-254-1148.